The growth of the the mobile web, as well as increased competition on the browser market, has created a number of new challenges for digital creatives. At the same time, technology has made great strides, allowing us to create new and exciting methods of communication and interaction. Many of these developments have been focused entirely on the digital, and the digital is the realm where most of us operate. Much is possible within the now familiar boundaries of the screen. Riccardo Giraldi came to Amsterdam to show us what can happen when instead of delving deeper into the digital, technology is used to go beyond these boundaries, involving the good old tangible world in the user experience. As creative director at B-reel, he has worked on many projects that do just that. One such example is Eels, a multi-player game involving projection mapping and the familiar mechanics of Snake. Each player can control a rather abstract eel as it slithers across the faces of a stack of cubes with graphics mapped onto them. As it is impossible to see every face of every cube from a single position, the game requires a lot of movement from the players. While trying to avoid hitting the other eels, players must also avoid bumping into each other as they move around. This extends the game world into the physical realm, creating something new and unexpected. A more commercial application of similar principles can be found in the Arial Fashion Shoot. In this project, a dirt-shooting robotic arm was hooked up to Facebook, where users could aim and fire at a laundry line with pieces of clothing slowly moving on it. Clothing hit with dirt would be washed on site, and subjected to round two. The the user interface on Facebook looked much like any simple shooter would, but in stead of being entirely digital, the game involved many physical elements. This combination created a novel experience, which was further enhanced by placing the entire installation in a crowded mall. Here onlookers could enjoy the spectacle, giving the players on Facebook an audience. Other projects showcased in the session involved controlling an actual car through the Internet and controlling a toy car with your mind. Mind controlling an actual cars does seem like the next logical step. All of the above are examples of how cutting edge technology can help us create new and unexpected interactive entertainment by taking what we have learned about the digital, applying it to the physical world, and blurring the boundaries between the two in the process. Blurring these boundaries by looking for new possibilities can also lead to new collaborations. Agencies and individuals exploring these may soon find themselves in need of engineers who know how to work a circuit board, rig a car with remote controls or hack a robot. Processing and the Arduino micro-controller platform are great tools for this, and are worth exploring now more than ever. 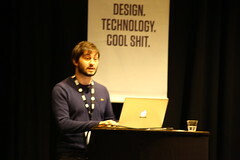 Regarding the process of creating such experimental projects, Riccardo emphasised the importance of prototyping. First, create a proof of concept. Once you know how to do it on a small scale, you just have to make it bigger. The latter is more expensive, but a lot easier than the former. He ended the session on one final note. As we often tend to use the web as a source of inspiration, there is a danger that we will end up looking at the same websites, which can lead us to come up with the same solutions. Different solutions are far more exciting, and seeking idea’s and inspiration beyond the digital can yield just that. Always keep looking at books, art and other sources to find idea’s for creating new and unexpected experiences. This post was written by guest blogger, Szenia Zadvornykh from dpdk, who attended and covered four sessions at FITC Amsterdam of which this is the first. Follow FITC on Twitter, Facebook or on RSS for updates.